Tom Petty and the Heartbreakers with Joe Ely, 8 p.m. in the Bayfront Center Arena tonight. Tickets $10. For more information, call 883-7251. LAKELAND -- For a band stuck on the fraternity beer-bust circuit in a Florida university town, the Lakeland Civic Center looms over the orange groves like the Taj Mahal. The lap from the Gainesville Beta Theta Pi house to the largest hall in central Florida must defy the imagination. But last Friday, in the middle of a national tour following the release of the band's Hard Promises, the lights came up and Gainesville's Tom Petty smiled his characteristically slow, toothy grin. "Hello Florida," Petty growled, to open the Heartbreakers' week-long Florida stand that includes shows here and in Jacksonville, Fort Myers, hometown Gainesville and, tonight, St. Petersburg's Bayfront Center arena. In the years since Petty, keyboards player Benmont Tench, guitarist Mike Campbell and drummer Stan Lynch left the state, the band has outlasted disco, survived an off-target New Wave label and ridden the resurgence of straightforward American rock 'n' roll. The voice that introduces the band makes that clear: "And now, from the United States of America, Tom Petty and the Heartbreakers!" And this week, the band brings it all back home -- to Florida. "We are kind of saturating Florida," said Tench in a recent telephone interview from Atlanta. "It's a real comfortable state. It will all be fairly relaxed, not like one night in Louisiana and the next in Georgia. "And the truth is, we haven't played Florida that much since we left. 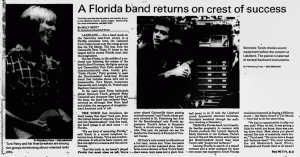 We've never played Gainesville (since gaining national success)," said Tench, those parents traveled to St. Petersburg last July for the Heartbreakers' only Florida appearance. Tench's father is Benjamin Tench, a circuit-court judge in Gainesville. This year, his parents can see the band at the University of Florida's O'Connell Center. This is a Florida band, but it has little besides geography in common with Florida products like Lynyrd Skynrd, Molly Hatchett or the Outlaws. There's more of '50s and '60s rhythm-and-blues in the Heartbreakers' sound that what Tench calls "boogie and barbeque." Leaving Florida in search of a record contract and a wider audience for their own music was imperative. 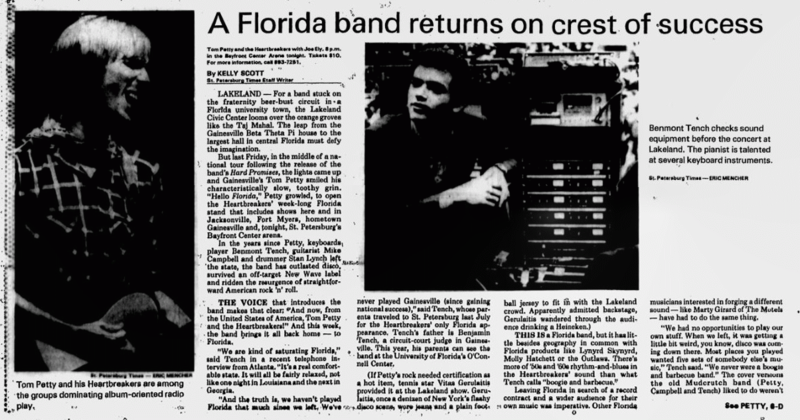 Other Florida musicians interested in forging a different sound -- like Marty Girard of The Motels -- have had to do the same thing. "We had no opportunities to play our own stuff. When we left, it was getting a little bit weird, you know, disco was coming down there. Most places you played wanted five sets of somebody else's music," Tench said. "We were never a boogie and barbeque band." The cover versions the old Mudcrutch band (Petty, Campbell and Tench) liked to do weren't the kind routinely down around Gainesville: songs by Bob Dylan, Gram Parsons, Jimmy Reed. In their shows these days, the band resurrects a few surprising old rockers -- their version of the old Isley Brothers classic Shout, spiced with Tench's hot organ work, has become their standard encore. Not that they have to reach into their past to provide good, identifiable sounds for their audiences. Of the successful rock groups that dominate album-oriented radio these days, Tom Petty and the Heartbreakers are the cream: Their high-quality pop hits, spanning for albums, include Breakdown, American Girl, Don't Do Me Like That, Refugee, The Waiting and A Woman In Love. The Heartbreakers have been all over the airwaves this summer, with a handful of songs from their Hard Promises LP and another with with a song written and co-sung by Petty on Stevie Nicks' solo LP -- Stop Draggin' My Heart Around from Bella Donna. What distinguishes Petty's songs from the drivel that often tops the record charts is the clean yet tough musicianship, and phrases that stick in the mind, likes like I'm not afraid of you running away, honey, I get the feeling you won't and You're the only one who's evr known how to make me want to live like I want to live NOW -- all sung in Petty's versatile mid-range, nasal growl. It's a great rock voice. And at last week's Lakeland show, Petty, once the victim of temperamental tonsils, was in fine voice. Beginning with some memorable moments from Heartbreaker heritage, the band runs through most of the songs from Hard Promises and the highlights from their breakthrough album Damn the Torpedoes. There is nothing glitzy about their shows: Petty wore a worn-looking flannel shirt, jeans and cowboy boots. There's little between-songs patter, no surprising effects and the band takes a while to warm up. But if you're there for the songs, you'll get what you paid for. NOTE: Make it a point to get to the show in time for Petty's opening act, Joe Ely and his band. Ely is a throwback rockabilly performer whose appearances as an opening act for Great Britan's The Clash and latest album Musta Notta Gotta A Lotta have gotten a ot of attention and critical regard in the current rockabilly revival climate in England. Ely is energetic, with a good, traditional rockabilly voice and a tight, seven-piece band. They put on a strong -- and fun -- 35-minute set before Petty and his crew hit the stage.